The ‘Ashby’ is a noted 1960’s building complex within the Queen’s University Campus providing accommodation to several Engineering Faculties. In 2004 the University agreed a strategic vision for the building to offer teaching, research and support accommodation to rival that of the most prestigious institutions in the world. Realizing this vision necessitated a rolling refurbishment of the Ashby Tower and Lab Block, home to the Schools of Electrical, Electronic Engineering and Computer Science (EEECS) and Mechanical and Aerospace Engineering (MAE). This was to meet the radical changes in Engineering education over the last decade which now focused on active learning and interaction with teachers. 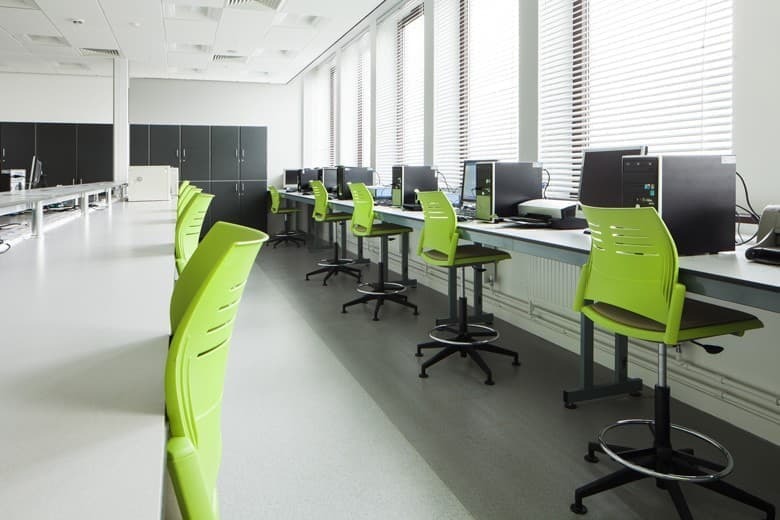 Consequently, the Ashby was redeveloped to create flexible and informal technology-rich areas for students to engage in problem-based learning, group work and the use of the internet for investigative learning. Research facilities throughout the building were also renewed to allow MAE and EEECS to maintain and build upon their internationally recognized position as world leaders in many areas of Engineering research. Felix O’Hare & Co Ltd played a key role in fulfilling this vision when we were appointed in 2011 to undertake complete internal refurbishment of the 2nd 7th, 8th and 9th floors with some minor works to the 5th floor to accommodate new services. 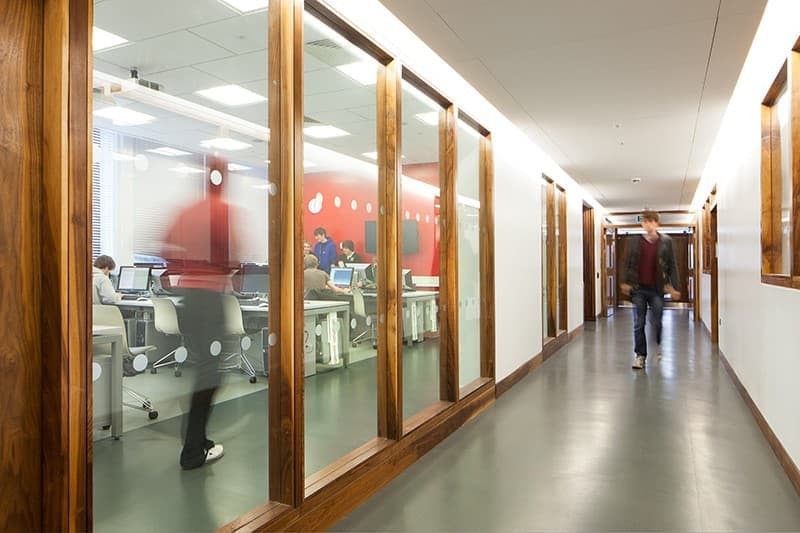 General works on all floors allowed for the removal of all redundant services and the installation of new lighting, power and data infrastructure throughout. New fire safety measures were also implemented. Specific works included the installation of a new goods lift serving the basement to ground floor level with the upgrade of the passenger lift servicing the ground to 7th Floors. This element required demolition of non-load bearing block walls in the basement to form the new lift shaft and installation of new trimming steel beam to allow the removal of the reinforced concrete ground floor slab. On each of the 7th, 8th and 9th floors we provided full strip out and reconfigured internal layouts to create new spaces for key departments (e.g. 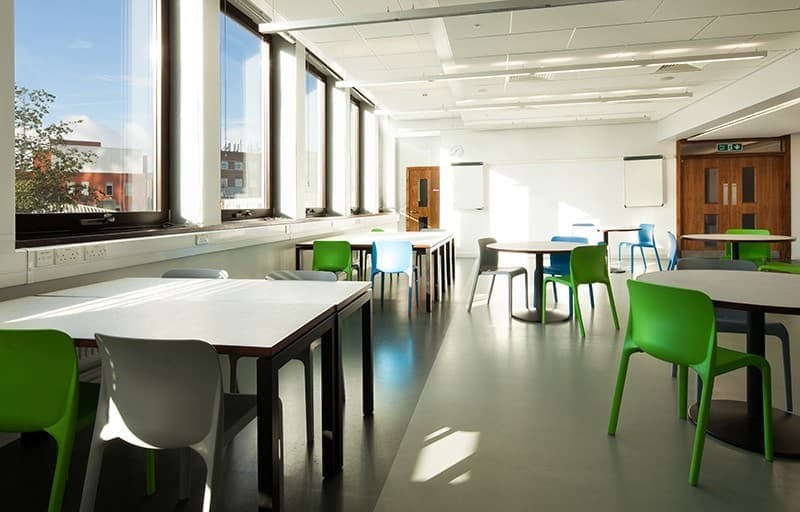 on the 7th floor we enlarged meeting rooms and staff rooms to accommodate the Electrical and Electronic Engineer General School office, academic offices and other staff rooms). 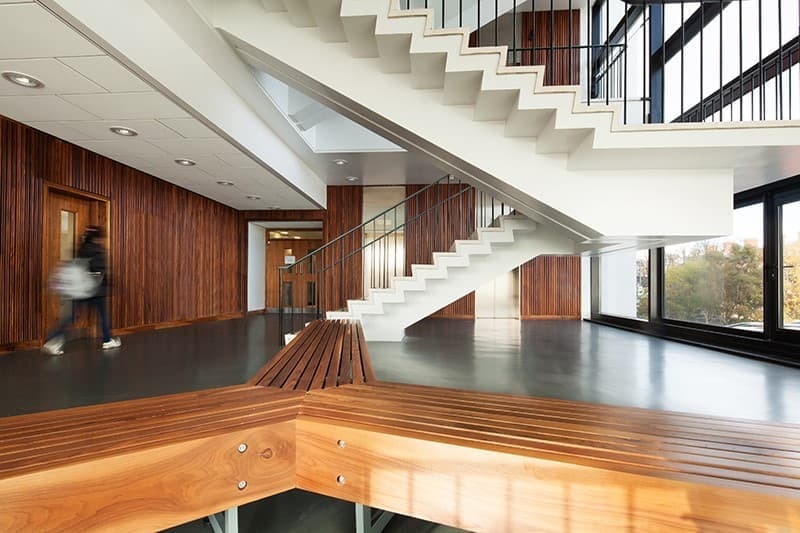 Elsewhere we replaced the entrance area roof coverings and fall arrest system, completed external painting and concrete repairs and fully refurbished the internal south staircase glazed screens throughout the building to the 9th floor. Our management team produced a fully resourced project programme which included key milestones, phasing arrangements and procurement schedules which was imperative in ensuring that the project was delivered to cost and on time. ‘Best in Class’ Project Management delivered this project on schedule, within budget and to the highest quality achievable. 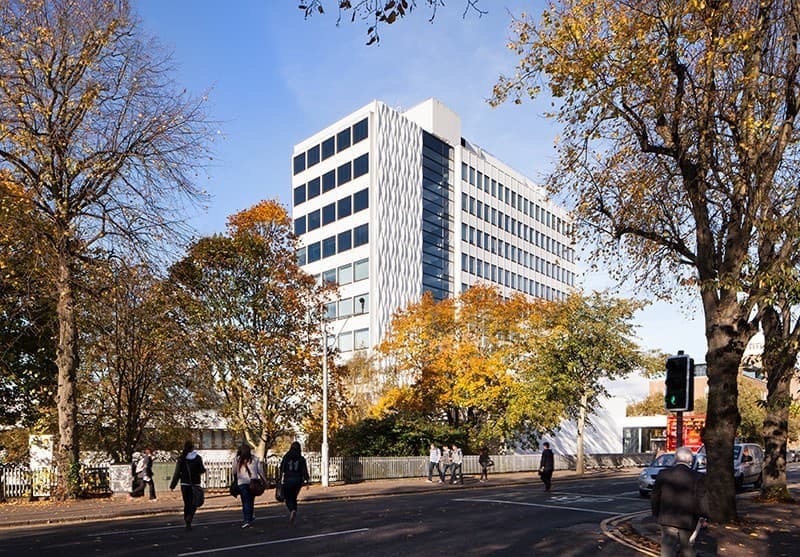 The BMS link was attained from the adjacent David Keir Building with a new fibre optic link contained within a new below ground duct system which was installed outside normal working hours within a live occupied building. We successfully worked a permit system with the university and had all services terminated in our new project in line with our commissioning programme requirements. 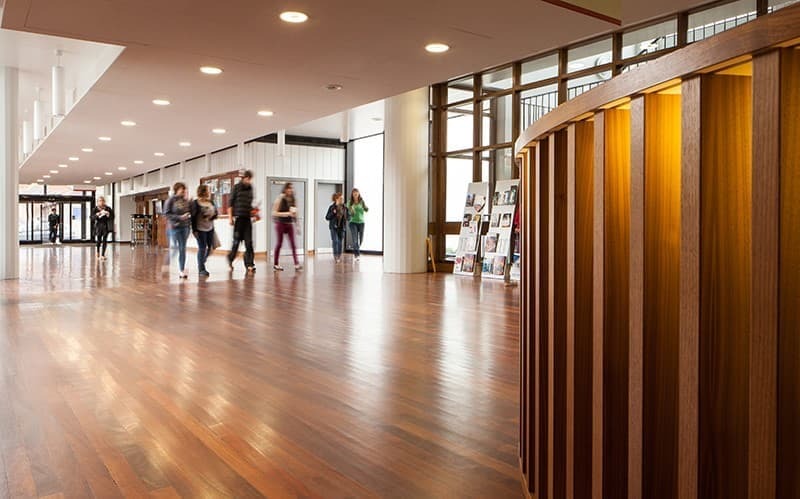 As this was a live campus the Risk Management process was a continually evolving one where we incorporated Risk Management into our daily project management processes and together with the team sought to develop an agreed risk management plan including a comprehensive risk mitigation strategy. This involved adopting a systematic approach to analysing and controlling areas and events and interfacing with the building power and data distribution systems avoiding potential for causing unwanted change.